It is really odd to see how sparse this new universe is. I suppose it was too hard to keep from having 30 years of books turn the 'simple' story into a plate of spaghetti logic to continue it forward into 'new adventures' without having a legion of story reading fans disappointed at not seeing their particular character favorites in the next movie, etc. This is the backdrop for "Lords of the Sith". From the cover blurb, I thought it was going to be a close look at the dynamics / interrelationship between Darth Vader and the Emperor. It sort of was and perhaps, I was hoping for more -- kind of a better understanding of the Sith-ian way of looking at things. I felt it never quite got there though. Again, my personal opinion. I have to say, when I read the first 2-3 pages, I had high hopes for this book. Those three pages had some great writing and even better view of Vader -- his pain and his reason for 'being'. Unfortunately, those same three pages were the pinnacle of the writing and the entire book in my opinion. I mean, look at that cover and the title! This newest book in Star Wars canon tells a story that would make most fans drool: Emperor Palpatine and Darth Vader teaming up to get out of a sticky situation. We saw the duo together frequently in the prequel trilogy as Chancellor Palpatine and Anakin Skywalker and then briefly once Anakin knows Palpatine’s dark side identity. We got an idea of the way they work together in the original trilogy too, but, I thought Lords of the Sith might provide a closer look at their budding master and apprentice relationship. This takes place 10 years after Episode III: Revenge of the Sith. The Empire is getting established and many are under the heel of the Empire / Emperor. Small groups have risen up to get from under that heel but most are hunted down and destroyed... the Empire is ruthless against anyone who tries to oppose them. And yet, one tiny group seems to be a bigger thorn than most. A group of freedom fighters on Ryloth, primarily the indigenous Twi'lek population, have been poking at troops, ships, and spice routes and being a larger pain than most. They get noticed by the Emperor and... the book tells all. The main Twi'lek 'hero' of the freedom force is a guy we met in SW: The Clone Wars cartoons... and he's the father of Hera -- the plucky pilot we later meet in the Rebels cartoon series. So, right up front, you can see the SW Universe 'masterminds' picking and choosing what bits to create this new weave of 'timeline history'. As with all the books we've seen from the 'old universe', it can be hard at times to tell an exciting, original story when you have to NOT kill certain characters (so they show up later in the next cartoon series or movie) and to take established characters -- be they Jedi or Sith -- and *do* any real character development because they have to stay the way they would appear in the next episode, etc. This is why I had hopes this 'buddy story' teamup starring Vader and Palpatine COULD have been a good one to develop the Emperor -- from the manipulative prune from the third movie into a fuller, darker Emperor. And, take Vader deeper into his embrace of the dark side (which I always thought was rather too sudden when he was still going back and forth about what was 'the right thing to do' even after chopping off Mace Windu's hand and allowing Palpatine to blow Windu out the window, etc.) The 'conversion' seemed too abrupt instead of a slow, progressive slide into darkness. True, Anakin was well on his way with his tantrums about power and control and his mindless slaughter of the sandpeople but, the movies never gave us a really good situation for that final switch to flip, in my opinion. Seeing Palpatine and Vader in this particular time period provided some context. Vader is still finding his way and learning to let go of the past as well as understanding Palpatine’s seemingly limitless power. It is interesting to see under Vader’s helmet and learn how he leverages hate and fear to become more formidable and to see a little of why is the way he is –- and the part Palpatine plays in who Vader’s become. Combining this book with what we know from the films might give you a better understanding into Vader by the time he strides onscreen in Episode IV. For those who are fans of Palpatine and the way he manipulates people around him, his intelligence and patience was on full display in the book — the moments in which he manipulates Vader are especially interesting –- but in addition to viewing Palpatine’s intangible skills, Lords of the Sith shows him in action. Palpatine is not sitting upon his throne on Coruscant; he is taking care of business in the jungle and in the thick of battle. Cool to read about but in one 'epic battle', it felt like the Emperor had 'limitless power' -- way beyond any he showed in his battle with Yoda in Episode III. I got tired of this 'energizer bunny' / never gets tired overpower mode after a bit. Again, me being a 'good story' snob I suppose. The action scenes were also the biggest flaw of the book for me. As I said, they were "big epic" level things but, they dragged on too long. At one point I found myself skimming to see how many more paragraphs or pages there was of a particular fight. I was tempted to skip ahead. We also get to witness some of the inner politics of the Empire. In some ways, it is like a giant corporation with people being lazy; people moving up to use that laziness to their advantage, etc. We meet Moff Delian Mors (again), known for being the first LGBT character in Star Wars canon, and she develops in a way some might not expect over the course of the book. On the rebellion side, it was a smart move to continue a story that started in The Clone Wars. The citizens of Ryloth did not want to be occupied then, and that has not changed. They want to be independent, and the way we see the Twil’eks fight will have a part to play in Hera’s backstory on Rebels. Her father is devoted to the cause and also conflicted by it. He makes the hard decisions, and he carries the weight. You can feel the loss of lives pressing down on his shoulders, and it adds layers of emotion and drama to all of his decisions. For the most part, the book takes its time with each of the characters mentioned above as well as others. The point of view changes between them, and the format works fairly well for this story. Kemp does a decent job at relating inner thoughts and making you feel like you have known a given character for much longer than a couple hundred pages. However, without getting specific and giving away spoilers, resolution for one of the characters sort of falls off the radar as the book ends in an abrupt fashion, and I did not feel the female characters in the story were developed as well as they could have been. 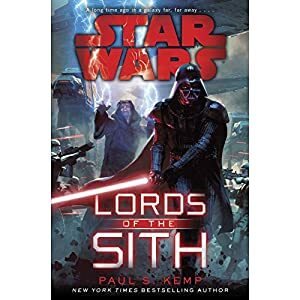 Overall, Lords of the Sith is a must-read for diehard SW fans. The book is a snapshot of the galaxy in a time when the Empire is on the way up and a bigger rebellion is a barely formed thought. It shows the extreme strength and cruelty of the Sith Lords as well as how others do not understand and therefore fear their power and as a result, makes the formation and eventual triumph of the Rebel Alliance that much more impressive. I suppose on a 1 to 5 scale, I would give this 3 sith lords. I don't know that I will ever invest my time in the new book timeline. I'm sure the new movie will be good (given JJ Abrams directing it—always been a fan since ALIAS), but Disney really spit in people's faces who had been reading the Expanded Universe since their teens, myself included. I always knew there would be a conflict between the movies (if they decided to make more) and the books. I had hoped that they would simply jump ahead to the end of the EU timeline and start the movies there. I'm with Aharon on this one. I tend to think now in terms of PD and AD Star Wars. The one great thing that the Star Wars universe had going for it was continuity. Yeah, it was an occasionally bumpy and messy one requiring a few backpedals and explanations on occasion but still it had an over all one big complete universe feel to it. Each new source built off of the previous established sources. I've yet to buy a single Star Wars product from the AD period, which doesn't mean I never will. I simply haven't felt that same pull to do so as I did before they wiped out everything that came before them and reset the universe. I admit I am not a huge AD era fan so far. I've watched the Clone Wars cartoons and they had some gems among a lot of "why did they waste time on this one?" installments. And, there were many times when their 'Jedi thought of the day' did not seem to have any connection to the actual episode. So much for Jedi Fortune Cookies. The first book I read of this 'new era' was "A New Dawn"... and it had potential but was a bit wishy-washy to me. And it was SUPPOSED to be the runup story for SW: Rebels, the cartoon. In the book, Kanan Jarrus is one of the few younglings to have escaped from the slaughter at the end of Episode III and has spent more than a decade running, hiding, and doing everything in his power to NOT call on the Force to stay alive. A New Dawn is when he runs into Hera and gets swept up in the fledgling Rebel Alliance. It was not a super bad book but could have been more. THEN the Rebels cartoons came out and boy, was I bummed. Before the first installment was over, Kanan was all over the place using the Force and swinging a lightsaber around... totally NOT what was represented as his character in the book. So, rather than taking a slightly different means of presenting what would become the Rebel Alliance, we got a near carbon copy of the original Episode IV movie -- an odd spaceship, a hotshot pilot (Hera), the 'wise old(er) mentor' (Kanan), big muscles alien, wonky robot companion, and 'the kid' (who, in the cartoon looked more like Disney's Aladdin then some kid off the streets of an alien world. (or as a 'generic' human male kid either). And now the Lords of the Sith book. I am keeping every finger crossed that we don't get a reboot of episode 4 'as envisioned by' JJ Abrams. The snippets I've seen hold a promise of a neat new jumping off point for stories. Now if only the reality in December can meet the potential available... we might have a fun future ahead. Would have honestly preferred if they would have set the new movies at the end of the EU or even better around the KOTOR era. Or even during the Tales of the Jedi era. Leaves the EU intact and gives them a huge universe to play in as they see fit. They kind of tossed out the baby AND the bathwater on this one, imo. The KOTOR era movie would be epic. As would any of the better story arcs from the 'time of the twins'. I never have a pull to read the sith books, but this takes away any temptation I had, so thanks for that Kol. I'll stick to the PD universe until something shows that it's worth reading. I'm reading Dawn of the Jedi now and it's good.